Elizabeth Buckley helped me to solve some problems, clarified some techniques, and I even experienced a couple of “Aha” moments. I feel that I am another step closer to finding my tapestry voice and truly connecting with my loom and materials. I flew in from Texas to take the "Curves in Tapestry" workshop at Elizabeth Buckley's studio. It was truly incredible. Although the subject matter is daunting to many of us, the way in which she presented the material was easy to understand and enlightening. Elizabeth is a gifted teacher and a very pleasant person. I very much appreciate her openness to sharing her talents with those of us just starting the journey of tapestry weaving. I look forward to several more of Elizabeth Buckley's classes and do not hesitate to recommend them to others. For twenty plus years I have been a restorer of Native American textiles. Elizabeth Buckley's workshop on "Explorations of Light and Dark: the Use of Value in Tapestry Design" was a huge breakthrough for me. She helped me to overcome my mental block against design through exercises with line and value, which were then shared with the class in all-embracing, thoughtful and very kind conversations. She easily matched her teaching level to the students’ experience, providing technical fine points to those who needed it and basic how-to’s to novices. Elizabeth is a joyful, articulate, funny and a hugely talented and intuitive teacher. My only regret is that I don’t live in a corner of her studio! Elizabeth Buckley traveled to Tucson to teach "Shading Techniques in Tapestry" to our Tapestry Study Group. I found Elizabeth to be a most knowledgeable and talented instructor. Her enthusiasm for all forms of tapestry is infectious. Part of her success as a teacher is her organization, having all materials ready to go the minute the class started, but not hesitating to help a student who was struggling with the basics. Short explanations and lecture sessions were interspersed throughout the workshop, increasing in complexity, to accommodate the student's increasing knowledge. I would recommend her classes to any one. Elizabeth's "Shading Techniques in Tapestry" workshop in Tucson was outstanding. Everyone felt they learned many new techniques. Elizabeth was very accommodating to each student answering questions and providing advise and suggestions. Our four days passed too quickly but I was able to finish my small sample in class. I am pleased with the results. I have been working steadily on my tapestry of Santa Barbara dome reflected in water. I am fully engaged in the image I chose, my leanings always towards realism. The shading options I learned in Elizabeth's workshop helped me move in the direction of "impressionism" and yet remain in my comfort zone. I am delighted to say that my experience as a student of Elizabeth Buckley's "Tucson Shading Techniques" four-day workshop was extremely positive. She is a most generous teacher, and warm and lovely person. I have recommended her workshops to my guild in Chicagoland. 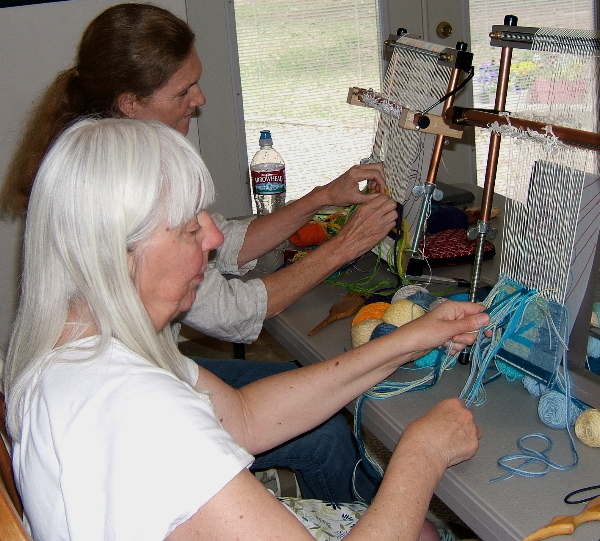 I feel fortunate that so many tapestry weavers are willing to teach and to share their knowledge of the craft. This past year was extraordinarily full of workshops for me, and I learned a lot from all of them, but there was something special about yours. Your four-day class was well-planned to take us through the steps that will lead to a tapestry, but there was even more to it than that. I think it was actually being in your studio that makes it different from all the rest. We (I and most students, I think) are trying to learn technique, but we are also trying to learn process--how you actually create a tapestry, how you get from idea to design to finished piece. So to be in your studio, to look at your loom, your finished pieces hanging on the walls, your books, your art supplies, your closet full of yarn, etc., is to be surrounded by all of the clues we need. For instance, I was only half paying attention while you were explaining the steps that led to your “Petroglyph and Prairie,” but later when I was free, I was able to look at the pieces--drawings, cartoon, yarn sample card--and rethink the process at my own pace. Whenever someone had a question about how to do something, from tapestry techniques to finishing, you could pick up a book or one of your own tapestries that would be a perfect example. It would be impossible for a traveling teacher to have all that handy. How can you anticipate all the questions students might have? Or the tools or yarn they might need? And simply being in your creative space taught us things that we would not have thought to ask. For example, seeing your drawings on the walls and coming to realize that one of them was not going to be a tapestry but understanding that it had its own purpose was instructive and interesting. I even wonder if there might not be some magic just in spending time where so much creativity takes place.